The fact that G M B Racing and trainer Al Stall Jr. are catapulting Tom’s d’Etat into Gulfstream Park’s Grade 1, $9 million Pegasus World Cup Invitational on Saturday off victory in a minor stakes is all you need to know about their belief in the 6-year-old six-time winner, who has made only nine starts and never more than four in a year. “We’ve always known he’s a special talent,” Stall said. “There are a lot of things that point to that: His race record, his (speed) figures, things like that are head and shoulders above a normal racehorse. He’s just a horse that, unfortunately, had a few nagging injuries over the years. He’s actually a really good moving horse, a clean-legged horse, and he’s just had some ankle stuff that has flared up from time to time. The good ones overcome it. Obviously, he’s got the heart to get through it. Bensel is G M B general manager along with senior vice president of communications and broadcasting for the Saints and Pelicans. Stall’s family is among the original season-ticket holders for the Saints, with Al having just turned 5 when the NFL awarded the city the franchise on All Saints Day 1966. With Tom’s D’Etat, there’s always some measure of breath-holding with how he’ll bounce out of a race or a workout. Before he ever ran, the youngster had a bone “flake” arthroscopically removed from an ankle. He won on his third attempt as a 3-year-old, a 1 1/8-mile maiden race by four lengths at Saratoga, then was off until the following March at Fair Grounds. After allowance wins at Churchill Downs and Saratoga (by nine lengths), the plan was to take on eventual Horse of the Year Gun Runner in the Woodward Stakes (G1). That was derailed when a shadow line on an X-ray indicated the possible start of a condylar fracture. The decision was made to be proactive and put in a surgical screw. Tom’s d’Etat didn’t resume racing for 15 months, when he won an off-the-turf allowance race at Churchill Downs by 7 1/4 lengths, which set him up for his 3 1/2-length score in the Dec. 22 Tenacious over stakes-winners Phat Man and Pioneer Spirit. The Tenacious was a big deal for G M B Racing and Stall, coming at their hometown track with a horse named for Tom Benson, a noted philanthropist who immortalized his hero status by keeping the Saints in New Orleans following Hurricane Katrina. Rather than thinking about what might have been – they can leave that for the Saints – Tom d’Etat’s team is just thankful for what is with the horse. 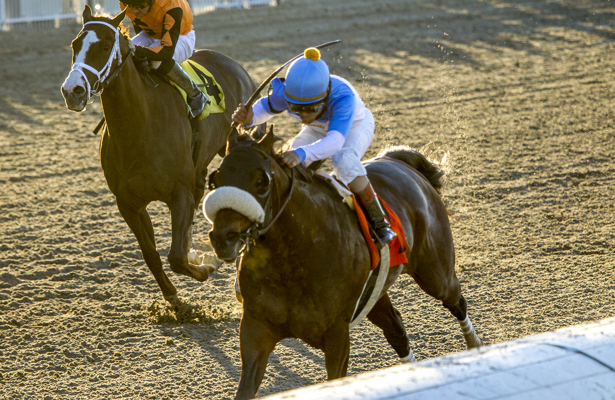 Tom d’Etat’s talent is such that Stall thinks it could approach the rarified ability of Blame, Claiborne Farm’s champion and stallion who handed the great mare Zenyatta her only defeat in the 2010 Breeders’ Cup Classic (G1). Still, the trainer emphasizes there’s a big difference between potential and accomplishments. G M B Racing is only four years old. The stable provides a budget each year to their three trainers — all New Orleans products who race at the Fair Grounds in the winter. Stall, Dallas Stewart and Tom Amoss then can buy whatever they want out of their budget. In the case of Stall back in 2014, it was the Smart Strike colt that cost $330,000. Coincidentally with the trip to South Florida, Tom’s d’Etat is out of the mare Julia Tuttle, named for the founder of Miami and the only female to launch a major American city. Naming colts for Tom Benson has reaped rewards. The Stewart-trained Tom’s Ready was a three-time graded-stakes winner in 2016 and ’17 who ran second in the Louisiana Derby (G2) and 12th in the Kentucky Derby (G1). Oklahoma Derby (G3) winner Lone Sailor, trained by Amoss and named for a Navy award Benson won, lost the Louisiana Derby by a neck the day after Benson was buried, finished eighth in the Kentucky Derby and sixth in the Breeders’ Cup Classic. Amoss also trained Mo Tom, a three-time stakes-winner who also was eighth in the Kentucky Derby.